It’s plentiful, if you know when and where to look. It’s a surface-dwelling, migratory, carnivorous critter that roams offshore pretty much everywhere there’s a warm ocean. It will eat just about anything, an appetite that makes it angler-friendly. It has a long, slender body built for speed. It is sexually mature at four to five months, with females spawning three or four times a year and producing 80,000 to 100,000 eggs each time. It rarely lives more than four years but can reach weights close to 100 pounds; while a 40-pounder is a trophy, the official International Game Fish Association all-tackle record is 87 pounds. A pelagic wanderer, mahi live fast and die young. A colorful pelagic wanderer takes to the air. Its coloring is magnificent: light blue when unstressed, changing to green and yellow when hooked. If a mahi is photo-worthy, it’s going to have to be gaffed, and when it’s on the deck, it can hurt anyone who gets too close. Capt. Randy Towe showed me how to get a great photo in this situation: throw the mahi into the fishbox for three to four minutes. As the fish starts to die, its coloring will flash through brilliant phases. A few minutes in the box also reduces the danger of holding a large green fish. Almost anyone who has access to an offshore boat along America’s southern coast has caught dolphin. The summer months seem to be the best, probably because of warmer water temperatures, calmer seas and more boats being on the water. In South Florida, July and August are known as trophy-catching time, but mahi pop up occasionally year-round. Smaller mahi travel in schools and tend to hang around floating debris; the bigger the debris is and the longer it’s been in the water drawing baitfish, the more likely it is to attract and hold mahi. I’ve found them around everything from a plastic jug to a floating palm tree. The standard practice for mahi in Florida consists of finding a weedline and trolling along it. The most common bait is a ballyhoo, usually behind feathers, but trolling with lures can be just as effective. When a dolphin is hooked, the trick is to fight it to the boat without gaffing it. Keep it in the water, and the school will follow it to the boat. Chumming with live pilchards or chunks of cut bait will keep the school feeding. Limits can be caught without starting the engine. They can be caught on light tackle with bait, jigs or surface plugs, even on fly rods. As long as you keep one fish in the water, the carnage can continue. Mahi tend to hang around weed lines and floating debris, anything from trees to plastic jugs. It’s also fun to “run and gun” for mahi the way guides in the Florida Keys do. Most guides run outboard-powered center consoles in the 25- to 35-foot range. The captain runs the boat from the tower at high speeds until he spots something fishy. Then he pulls up to patches of sargassum, floating debris, birds working bait on the surface or whatever else he spots. Anglers throw plugs or jigs or a ballyhoo rigged on 20-pound spinning tackle. If a mahi is spotted, a little chum always helps. If there’s no action after a few minutes, the running and looking resumes. An average mahi in Florida is probably 5 to 12 pounds, which is the size that travels in schools. When the mahi get bigger than 15 pounds, they tend to travel in pairs — a bull and a cow. 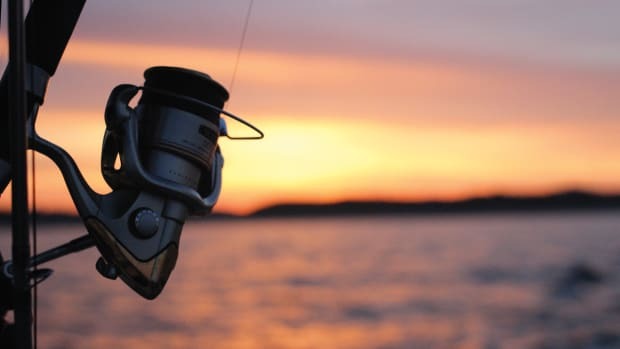 If one is hooked, the other will stay with it right up to the boat unless the second fish hits one of the other lines that are out. Double hookups while trolling are common. Mahi are excellent game on a fly rod. For large schools of smaller fish, a 9-weight rod is fine. It doesn’t matter whether you’re using a floating or sinking line, and any baitfish pattern or popper can produce strikes. Oversized Clouser minnows are particularly effective. A 50-pound mono shock tippet is advisable even for the little guys because they do have teeth. If you’re after the bigger fish, a 10- to 12-weight rod is recommended, with a reel that holds plenty of backing. Mahi can hit 50 mph, and a big one on a fly rod will burn you. Many years ago, my friend Tony Nobregas and I were fishing with Capt. Robert “R.T.” Trosset out of Key West, Florida, hunting big mahi. We found a couple of schools of small fish, and around midday we came upon an extensive weed line, but we couldn’t find any larger fish. R.T. put out a ballyhoo and trolled. The plan was to have one bait in the water, hook a big mahi and lead its partner into fly-rod range. An experienced angler, Tony had a 12-weight fly rod that he used for tarpon and an 8-inch fire tiger baitfish fly. He had a 15-pound tippet with a 60-pound shock — pretty much the same rig he used for tarpon. We trolled that weed line for close to half a mile before we had a strike on the 20-pound bait rod. It was a good fish. 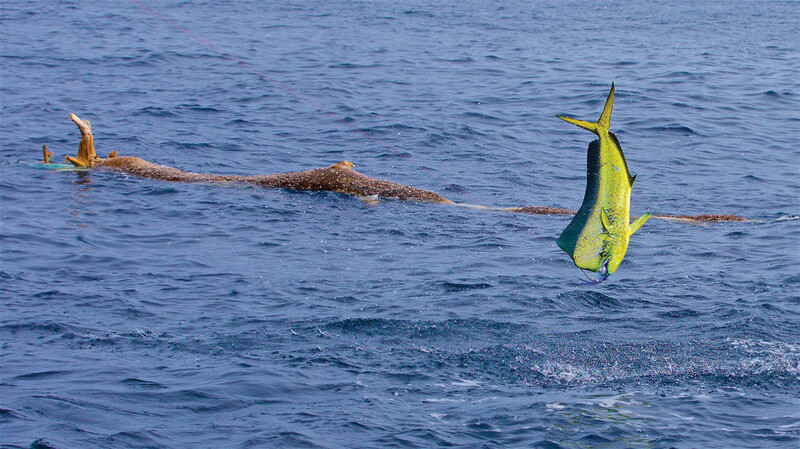 Mahi jump repeatedly, which adds to the fun and gives you a good view of their size. As I worked the fish in closer, we could see that it was a cow. R.T. estimated it to be more than 20 pounds. Then we saw the trailing bull. It was huge. It made five swipes at the fly before Tony hooked up, and as soon as he did, two things happened: The bull took off on a long run, and I tried to horse the cow over to the gaff. The cow didn’t horse too well, and by the time it met the gaff, Tony was almost out of backing. As the mate threw the cow into the fishbox, I noticed that the fish was a lot bigger than I’d thought. R.T. lit up the engines and ran down the bull until Tony had the fly line back on the reel. Then the real fight started. The closer we got to the bull, the bigger it looked. Tony would just get it into sight, and it would run off another 50 yards of line. At one point it jumped right next to the boat; it was probably 5 feet long. R.T. had estimated the cow at 25 pounds and figured the bull was more than 40. Pound for pound, a big dolphin is about as tough a fish as there is to catch in the open ocean on a fly rod. As the fight went on, Tony kept bringing the fish up to the boat but couldn’t get it into gaff range. Tony is an expert at catching 100-pound tarpon on a fly, but this mahi was giving him all he could handle. After several close encounters, Tony leaned back a little too hard and a little too high. The rod snapped, and the tippet parted. Tony was exhausted and heartbroken. Even R.T. was bummed, admitting that it was the biggest mahi he had ever seen hooked on a fly. When we got to the dock that afternoon, the cow weighed 38 pounds. The bull must have been close to 60. The moral of the story: Never pass up a chance to catch a bull dolphin on a fly rod, and be prepared for a workout. Mahi that size are rare in Florida, and some years are better than others for finding them. The “slammers” used to show up in May and June, but over the last few years July and August have been better, says Capt. Randy Towe, who fishes for mahi out of Islamorada. Even during peak season, finding mahi is a hit-or-miss proposition; it’s a big ocean, and they are constantly moving. It’s not like you can save a GPS position and go back to it. Luck is always a factor, especially with the big ones, because finding some form of flotsam is the first step. The moment of truth arrives first as a shadow. The author says he’s still searching for a monster mahi on the fly. The most consistent place I have found huge dolphin is Piñas Bay, Panama, from mid-November through January. If you check the IGFA fly-rod records, you’ll find that a lot of them came from the Tropic Star Lodge in Piñas Bay. In 1964, Stu Apte caught a 58-pound monster on 12-pound tippet. Ariel Kane set women’s records there for 12-, 16- and 20-pound tippets in 2003 and 2004. 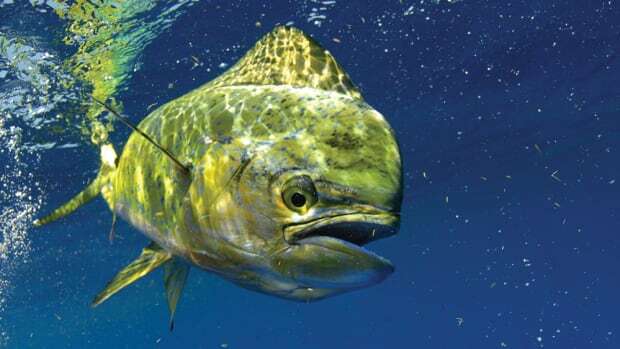 The all-tackle record mahi came from Costa Rica, and Rufus Wakeman set the 16-pound fly record of 53 pounds, 8 ounces in 1999 in Isla Mujeres, Mexico. But if I were trying to set a fly rod mahi record, I’d go to Tropic Star. The lodge has access to the best marlin waters outside of Australia. It runs a fleet of Bertram 31s. A typical day consists of catching bonito in the 5- to 12-pound range, then slow-trolling them for marlin. A 40-pound mahi, to these captains, is a pest. 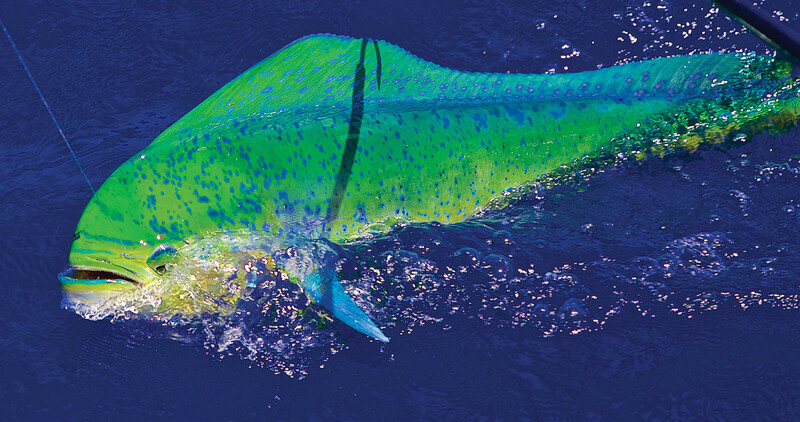 Big mahi come into the spread and attack the live bonito, which are too big for mahi to swallow (or swallow quickly). A big mahi will kill the bonito, and live bonito are precious. The tuna tubes hold only six baits. When you run out, you either have to troll lures or run back inshore to restock, so a mahi killing a bait is unacceptable. Mahi don’t tease up to the boat on hookless baits the way sailfish do. 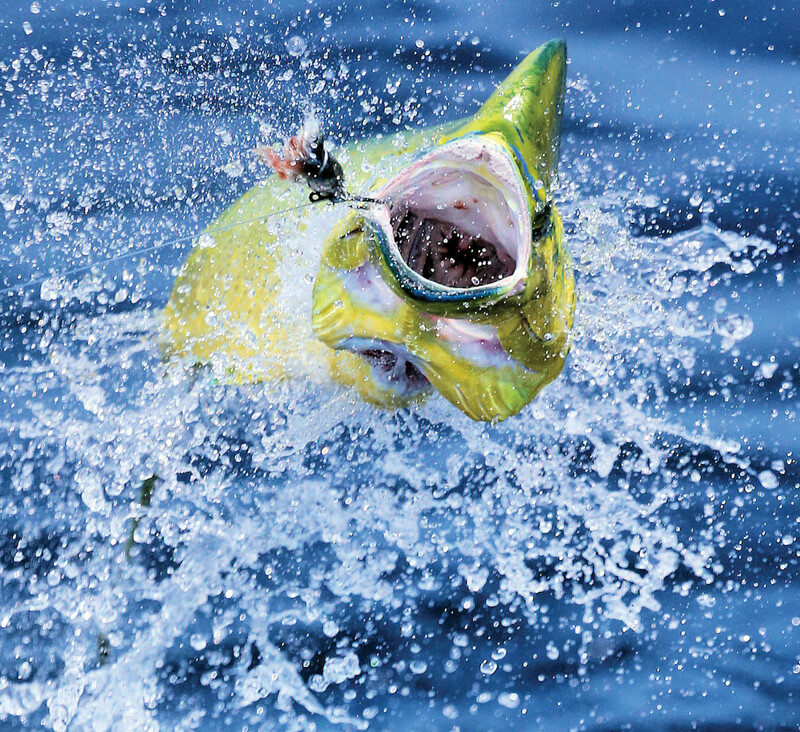 Mahi have sharp teeth and usually make one pass at a tease bait, cut it in half, then lose interest. 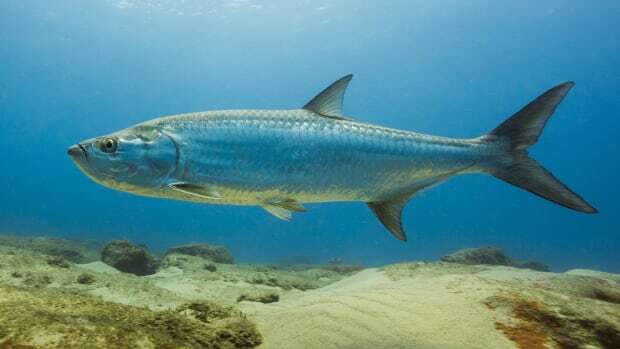 However, they will stay on a live bonito and follow it up to the boat as the mate frantically tries to save it. 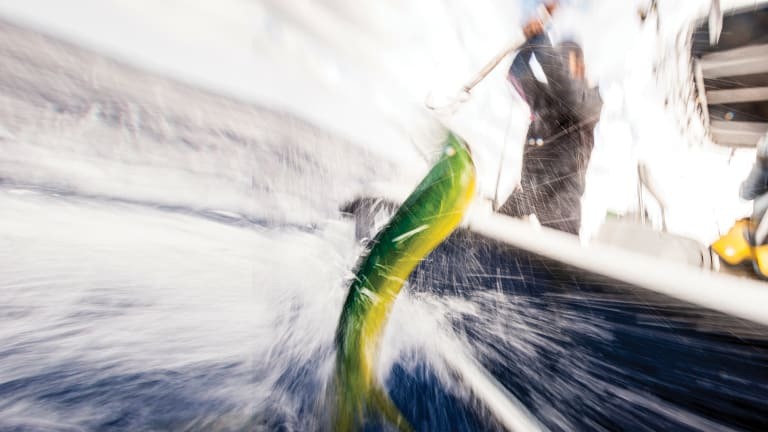 Usually, a Tropic Star crewman will drop a strip bait back to the mahi — a technique that will produce an instant strike — but I’ve found that a big mahi will hit just about anything you drop back to it when it’s in hot pursuit of a bonito that just disappeared into the boat. And they’ll go after a fly, if it’s the right fly. The first time we had a big mahi chase a bonito, I threw a standard baitfish pattern at it. Nothing happened. The mahi was chasing a 10-pound bonito, and a pilchard-size fly didn’t get its attention. The strip baits that the mates had rigged got instant strikes, but the baits were more than a foot long. If the fish keyed in on something big, you needed to feed it something big. The next chance I got, I threw the standard pink and white Cam Sigler sailfish fly, which is sort of a popper. No bites. That fly works fine in Guatemala, but the Panama mahi were unimpressed. I never did catch a trophy mahi on that trip, so I did some fly research before my next visit and found Rainy’s 6/0 Ocean Candy, a double-hook fly that’s 12 inches long. I put an 8/0 Owner hook on as the trailer, added an 80-pound shock to a 20-pound tippet and was set. I chose the same 14-weight rod I use for sailfish but soon realized that no matter which line I used, I wasn’t going to cast the Ocean Candy very far. The good news was that I didn’t have to get it more than 30 feet behind the boat, and the cast didn’t have to be pretty. Technically, the boat has to be in neutral when the fly is cast for a fish to be a legal IGFA fly catch. The Tropic Star captains have no concept of neutral. 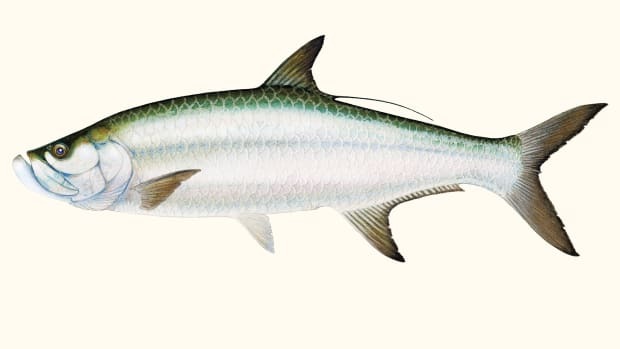 They are simply trying to save the bonito as marlin bait. If you’re not after record fish, it really doesn’t matter. But if you’re a stickler on rules, you need to explain the procedure to the captain in detail — and, preferably, in Spanish. 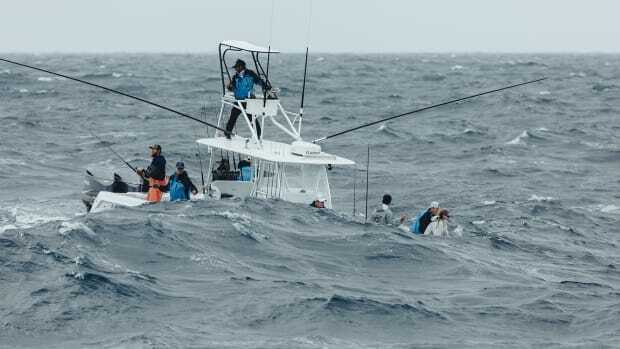 Just before my next trip to Tropic Star, a friend reported that the mahi bite was in full swing, so much so that the anglers decided to have a one-day dolphin rodeo. My buddy’s boat caught a 5-foot mahi right off the bat, and they figured they had the contest in the bag, so they went back to chasing marlin. At the end of the day, their dolphin weighed 64 pounds — and came in fourth. The winner was 73 pounds. Man, do I want a shot at one of those monsters on a fly rod. As it turned out, the Ocean Candy was magic. We caught several mahi in the 30-pound range and hooked up one that was probably more than 50 pounds, but it spit the hook after several jumps. I’m confident that a fly-rod world-record mahi could come out of Tropic Star in the near future. The only real challenge is that the crew will have to ignore marlin and spend the majority of their time searching for dolphin. That’s a difficult decision to make. 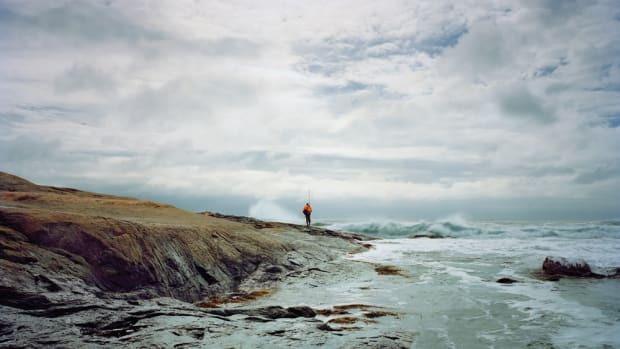 If you want to set a record, you’ll have to get one of the few captains who understand fly-fishing, and stay focused on the prize. That’s my quest. 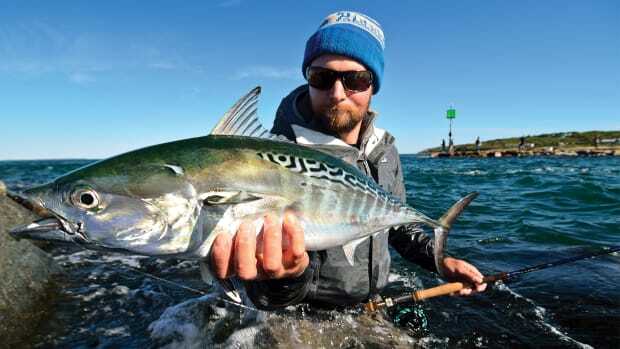 Albies, little tunnies, fat Alberts — call them what you want, but once you hook one on light tackle, you’re doomed to chasing them for the long run. 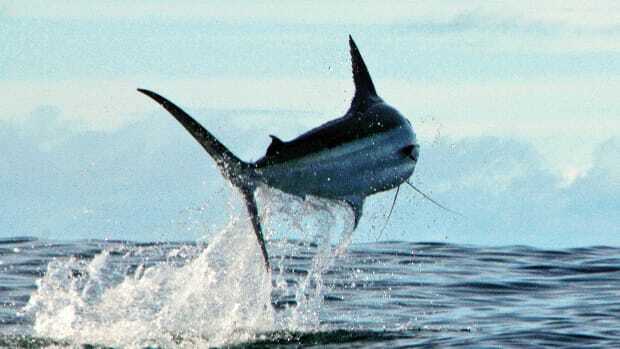 One of big-game fishing’s greatest practitioners, Ernest Hemingway believed that fighting large marlin and tuna should be a fair contest of strength between fish and fisherman. When it comes to big-game fishing, sometimes it’s better to be lucky than good.